Let’s begin with an experiment. Take a moment to notice your breathing. Notice the way the skin beneath your nostrils stretches as you inhale, the way your chest gently rises and falls, the movement of air inside your lungs. Now, as you go on to read this article, try and keep noticing. Let’s see how long you can maintain this heightened awareness. 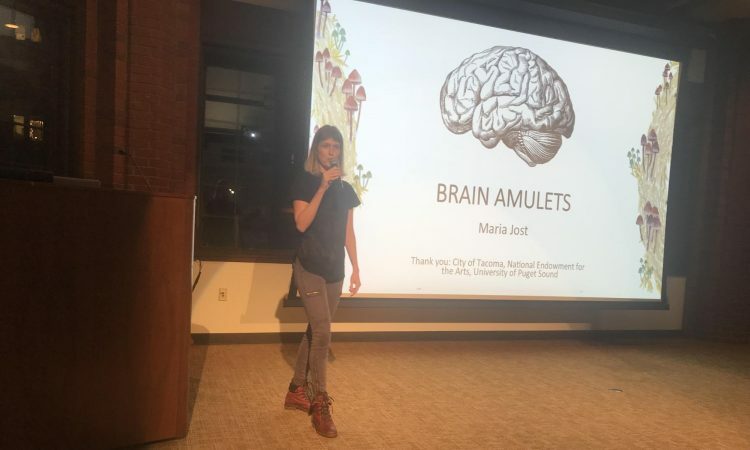 This was the same challenge Religion Professor Stewart Smithers posed to the audience during his portion of a joint lecture with Puget Sound alumna and artist, Maria Jost. On Thursday, November 29, at 6:30 p.m., the Puget Sound Arts and Sciences Salon Series brought Jost and Smithers together to discuss neuroscience, brain-care, mediation and what it means to be human. “This idea of course, is pretty much impossible … but they try. … Even in their failures, they manage to establish a certain measure of their capacity for continuous attention,” Smithers said. And so, rather than attempt the impossible task of praying ceaselessly, Smithers urged the audience to simply try and apply that same “continuous attention” to their own breathing until he finished speaking. Research now shows that activities, such as prayer, meditation or simple “mindfulness practices” for the less religiously inclined, actually physically affect the structure of the brain. The original 24” x 24” illustration was then shrunken down to a 3” x 3” card, on the back of which were printed three brain-care practices including practicing 30 seconds of gratitude, 10 deliberate and focused breaths, and physical connection with another organism. All of these practices are scientifically proven to bring the brain out of the negative ruminative cycle. In our fast-paced modern world, stress is often regarded as the norm. Smithers spoke to this problem towards the end of the evening, describing the ways in which we tend to ignore our mental needs, as we assume mental suffering is just what it means to be alive right now. And therein lies the first step in changing the culture surrounding mental health. We must first acknowledge that there is a problem. We must refuse to accept suffering as standard or necessary. We must stop and ask, Am I still breathing?